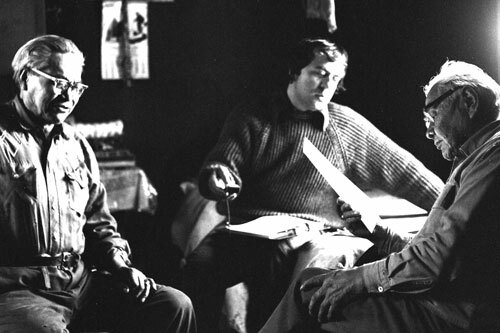 Based on oral history gathered during 1977 and 1981, Kennedy and Bouchard's comprehensive study of the Aboriginal people of the Desolation Sound area is Sliammon Life, Sliammon Lands (1983), a collaborative work that describes the cultures of the Sliammon, Homalco and Klahoose First Nations on both sides of the northern Strait of Georgia. Although the title refers to the people at the village of Sliammon near Powell River, most of the information gathered was related to the Klahoose. Kennedy, a photographer, and Bouchard, a linguist, also collaborated on Lillooet Stories (1977), Shuswasp Stories (1979) and The Lil'wat World of Charlie Mack (2010), a tribute to their long-time collaborator and Mount Currie Reserve storyteller, Charlie Mack, who was born in 1899 and died in 1990. They present his world view, moral code and English versions of his stories drawing on transcribed interviews, correspondence and field notes. Bouchard, Randy & Dorothy Kennedy (editors). Shuswap Stories (Vancouver: CommCept, 1979). Bouchard, Randy & Dorothy Kennedy. Sliammon Life, Sliammon Lands (Talonbooks, 1983). Bouchard, Randy & Dorothy Kennedy (editors). Boas, Franz. Indian Myths and Legends from the North Pacific Coast (Talonbooks 2002). Translated by Deitrich Bertz. The Lil'wat World of Charlie Mack (Talonbooks 2010). [BCBW 2010] "Anthropology" "First Nations"
Opening Indian Myths and Legends from the North Pacific Coast (Talon $65) is something like looking into the first English edition of the Dead Sea Scrolls, except that here we are dealing with a greater diversity of spiritual traditions and peoples. This 702-page version of Boas-translated by Deitrich Bertz, edited and annotated by Randy Bouchard and Dorothy Kennedy-is one of those monumental books, slightly grizzled and flawed by time, that offers astonishing visions of another era. Collected in the 1890s by Boas on a series of field trips to coastal and interior regions of B.C., the oral traditions represented draw on a dozen First Nations and up to 15 languages. Put together painstakingly over the course of a generation, starting in the 1970s, the resulting annotated translation is a tribute to the editors, the publisher and the B.C. Indian Language Project, which sponsored it. In spite of the weight of scholarship and the enormous variety of material, Myths and Legends is a handsome, accessible volume. The narratives retain pride of place with the apparatus tucked quietly but usefully at the bottom of each page. Any book sailing into its second century is bound to have baggage-shortcomings where shortcomings would never have been guessed at the time of compilation. Boas' recording technique left a lot to be desired, depending as it did on third parties or scanty knowledge of local languages picked up on the spot. He failed more often than not to even identify his Native informants. The young anthropologist also complained about the long-windedness of his sources. They often repeated themselves in ritual patterns he failed to comprehend while he scrambled to keep up with the "story. "; The editors rightly draw our attention to these rough spots. Many of these tales are based on an interpreter's sketchy translation of an unknown speaker talking in an aboriginal dialect reconstructed later, in German, by Boas from his notes. Bouchard and Kennedy single out some renditions of the ancestor legends from the Southern Kwakiutl as particularly "superb...resplendent with genealogies and the identity of carved figures on the remaining village poles. "; Though a European of his era, Franz Boas was a man with a mission to record -as widely as possible - the oral culture of what, at the time, were known as "the vanishing tribes,"; peoples being driven to extinction by disease and social and political aggression. Boas' great virtue as a recorder was his commitment to the specificity and historicity of the materials he collected (sometimes, in the case of "artifacts"; and bodily remains, with some degree of subterfuge). He was less interested in proving a sweeping theory than in amassing data which future researchers could assess in greater depth. But the holy grail for all collectors-a unified theory of mythology-still had its appeal. Boas was not immune to the great search for "the laws of the psychic development of man,"; as he put it. This project was to occupy mythographers, from Freudians to Structuralists, for much of the twentieth century, with profoundly mixed results. Boas wasn't untouched by the longing among students of comparative religion and myth for our versions of human stories. But he criticized what he rightly saw as excesses in the comparative method. The idea of some sort of original source of myth is as old as belief in the Bible, and has a very natural appeal to assimilationists of all sorts. The antidote has been a return, among indigenous peoples themselves, to the "authorized tradition bearer"; whose stewardship of oral history is sanctioned by a context far more elaborate and deep than anthropologists were capable of realizing. Narrative is only one dimension of many of these stories, which are laden with cultic references to family histories understood only by initiates in clan ceremonies. So what are we to make of these visionary tales of Raven stealing the sun, of concupiscent tricksters like Mink, stories of violence, magic, wisdom, and deep humour? Have they a place in the twenty-first century, for all the deficiencies of their transcription? The answer has to be a resounding, Yes. Myths and Legends preserves the ancestral voices of this province, a distant music often imperfectly understood by the recording ear, but vividly alive, waiting to be brought home. In this process not only First Nations cultures stand to be enriched, but their neighbours as well.